Australian PM Tony Abbott recently opened an art exhibition titled “Bali: The Island of Gods” at the National Gallery of Australia (NGA) in Canberra. The exhibition features several artistic creations: sculptures, paintings, and textiles inspired by the Balinese culture. Among attendees at the opening were Australian government officials, diplomats, academicians, and local people. Indonesian Ambassador to Australia Nadjib Riphat Kesoema stated that although Bali was already popular among Australians, the exhibition will show the amazing diversity of Balinese culture and art to the visitors. He remarked that Bali was the perfect example of the Indonesian people’s warmth, openness, and tolerance towards the people of other cultures. He also remarked that even though Bali was visited by millions of foreign tourists every year, the Balinese still manage to maintain their traditional values. Pak Nadjib expressed wish that the Canberra exhibition will help to build an understanding between the people of Indonesia and Australia. As neighbours, both countries should work together for the benefit of their peoples. Meanwhile, Australian Prime Minister Abbott highlighted the importance of relations between the two nations. 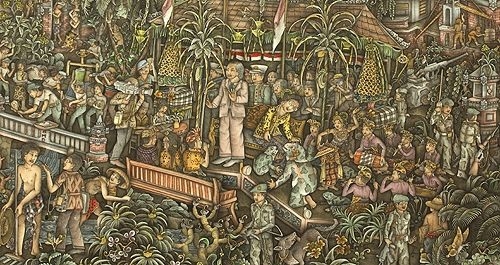 He believed that the exhibition can be one of the ways for Australians to get a glimpse of the “soul” of Indonesia. The prime minister also stated that Indonesia and Australia had strong bilateral relations, and the people from both countries should focus on maintaining those ties instead of other issues. 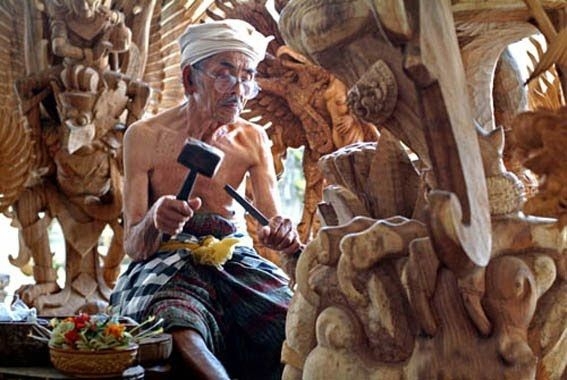 The arts and crafts of the island of Bali have charmed visitors for centuries. 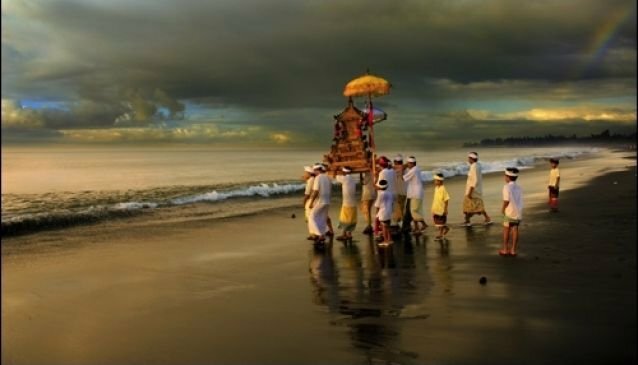 Being the only large and vibrant Hindu community surviving outside India, Bali epitomises the colourful and creative impulses associated with the rich cycle of Hindu festivals, communal celebrations and daily worship. The wide range of works—sculpture, textiles, paintings, architectural elements and ritual objects—in the National Gallery of Australia, Canberra’s exhibition of Balinese art will excite and surprise visitors, especially those who have journeyed to the exotic island. Bali’s fabric traditions are rich and varied, readily demonstrated in the examples drawn from the National Gallery of Australia's world famous collection of Indonesian textiles. The most admired are the geringsing, created only in one village in east Bali. Through double ikat, the most complex of techniques, both the warp and the weft threads are separately tied into the designs, which only become evident when interlaced during the weaving process. In the NGA collection, the most striking of the handspun cotton geringsing display scenes of praise and adoration akin to the bas relief stone sculptures on Hindu temples in Bali and on surviving relics from mediaeval Java. Balinese textiles are vibrantly coloured, with heroic figures, floral fantasies and dynamic religious symbols woven in silk, sequins and gold and silver thread. Painted hangings, found in and around temples and shrines during temple festivals, also draw their imagery from Hindu symbols and legends, most notably the tensions and battles in the Ramayana and Mahabharata. Included in the exhibition are two fine ider-ider, narrow valances illuminating scenes from the great Hindu epics that decorate the eaves of open air pavilions: one ider-ider from the collection of the late Professor Anthony Forge is over 17 metres long. Drawn from the Adiparwa, the first book of the Mahabharata, a recurring theme on the large hangings used as backdrops at temple rituals, is the creation of the universe from the Ocean of Milk as it is churned by opposing forces of gods and demons pulling on the great serpent. The NGA collection includes three superb manuscripts with similar subject matter from the Mahabharata: the Adiparwa and the Smaradahana are formed from long rectangular palm leaves incised in intense detail. The third comprises exquisite double-sided ink drawings on English laid paper dated 1811, the period of Raffles' brief governorship of the Indonesian archipelago, before he decided he preferred what is now Singapore. It illustrates the Ramayana, probably the best known of the Indian epics, with scenes of the distressed Sita in captivity on Ravana's island, the monkey general Hanuman carrying her ring back to her searching husband Rama, and the monkey army constructing the causeway across from India to the island to mount the successful confrontation and rescue. The Balinese sculptures in the exhibition are brilliantly painted and range from overtly Hindu images, such as the god Vishnu mounted on his vehicle the giant Garuda bird, to ferocious guardian creatures whose destructive powers balance the benevolence of other deities to maintain cosmic order. Often composed of elements of real animals, birds and fish, such demonic creatures feature bulging eyes, menacing fangs and dangerous claws. Drawn entirely from the Gallery's important and diverse collection of Balinese art, the Bali: island of the Gods exhibition will be accompanied by an informative illustrated catalogue. Runs from 13 June – 3 August 2014. Opening hours 10am – 5pm.